Those who have deep data analytic skills - data engineers, statisticians, data scientists - are often in their own specialised area with a business. This area is separated from those who own and understand data assets. Such a separation is reasonable: most BAU data collection streams don't have a constant demand for advanced analytical work, and often advanced analytical projects require data sourced from a variety of business functions. Unfortunately, success requires strong engagement between those that deeply understand the data and those that deeply understand the analysis. This sort of strong engagement is difficult to moderate in practice. We've seen cases where because of the short-term criticality of BAU work or underappreciation of R&D work, business data owners are unable to appropriately contribute to a project, leaving advanced analytics team members to make do. We've seen cases where all issues requiring data owner clarification are expected to be resolved at the start, and continued issues are taken as a sign that the project is failing. We've seen cases where business data knowledge resides solely in the minds of a few experts. Data analysis requires data context. It's often said "garbage in, garbage out", but it's just as true to say "meaningless data in, meaningless insights out". 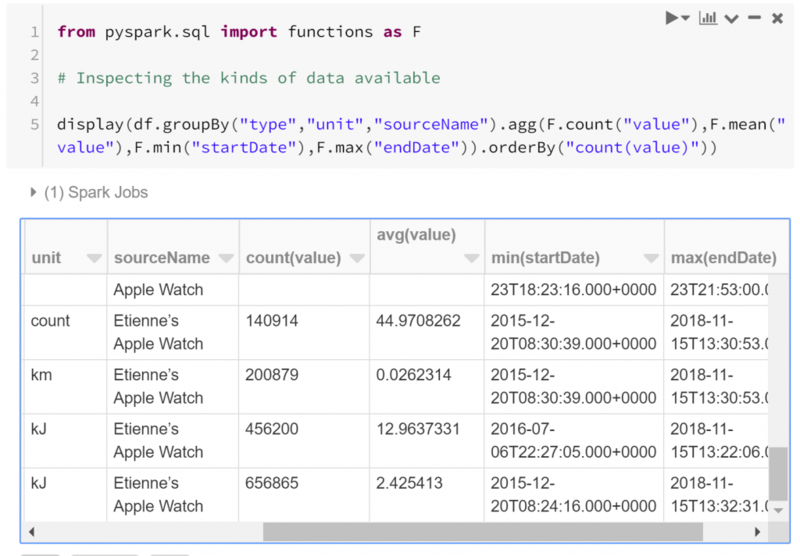 Databricks improves this picture by encouraging collaboration between data knowledge holders and data analysts, through its shared notebook-style platform. Investigation and implementation are two different worlds. Investigation requires flexibility, testing different approaches, and putting "what" before "how". Implementation requires standards, stability, security and integration into systems that have a wider purpose. We don't believe in this black box view of data science. Data science can be complicated, but its principles and the justifications within a project should be understood by more than just nominal data scientists. This understanding gap is a problem for an organisation's maturity in the data science space. The process of converting the XML data into a dataframe could be overlooked. It's not terribly exciting. 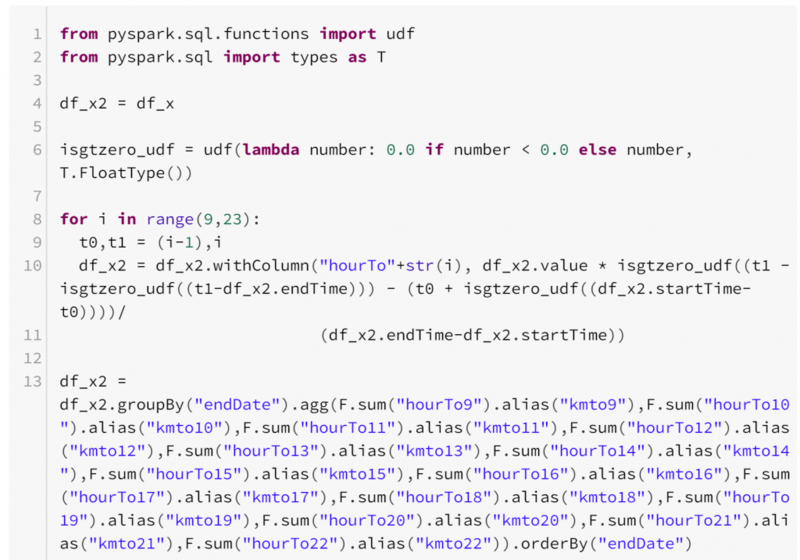 But it does demonstrate the simplicity of parallelisation when using Databricks. 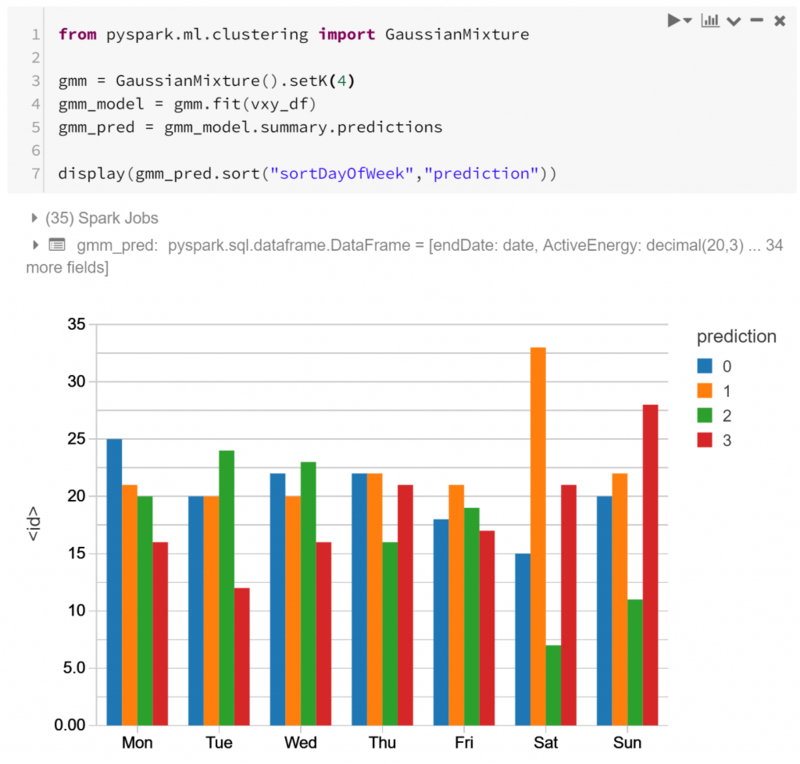 Databricks is built over Apache Spark, an engine designed for in-memory parallel data processing. The user doesn't need to concern themselves how work is parallelised*, just focus on what they need done. Work can be described using Scala, Python, R or SQL. 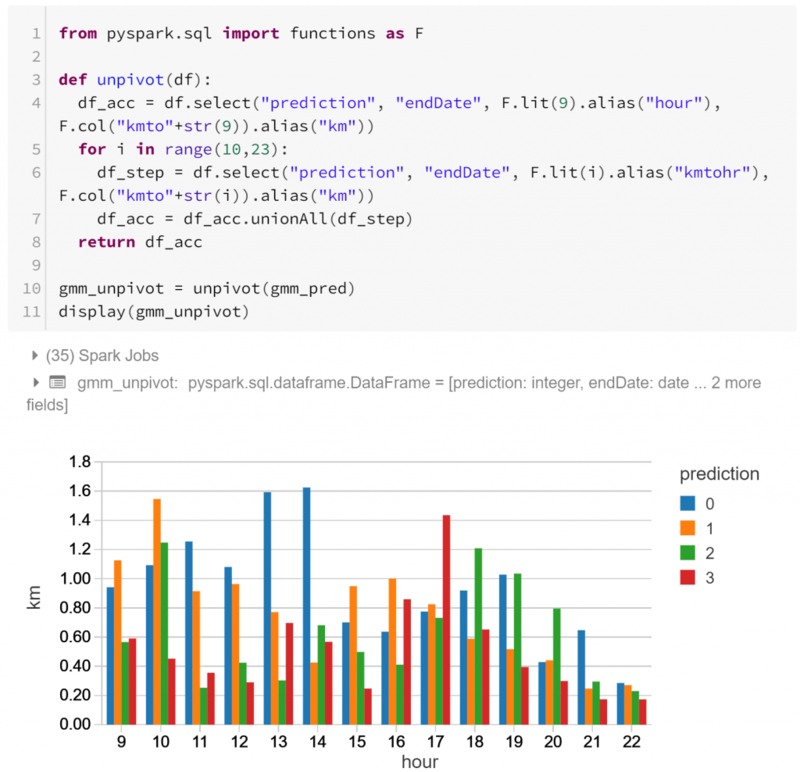 In this case study we'll be using Python, which interacts with Spark using the PySpark API. 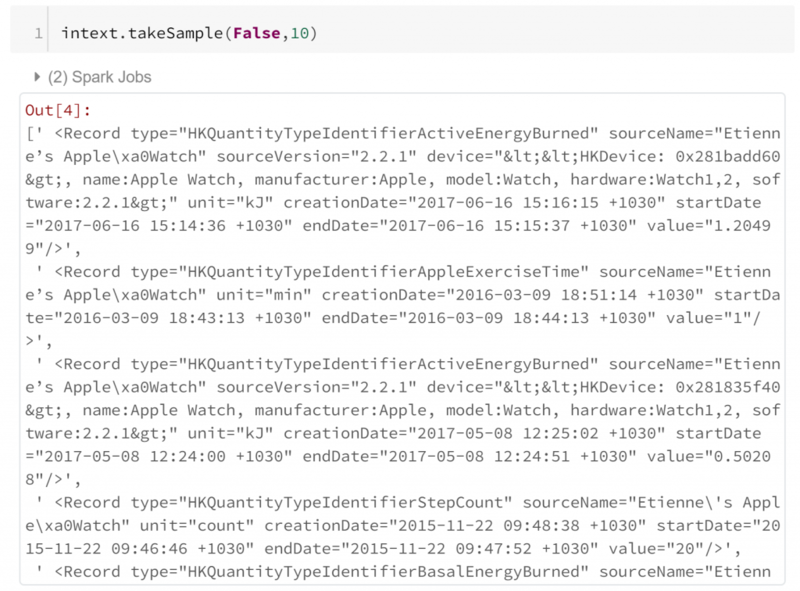 Since we've previously mounted our XML biometrics summary, we can simply read it in as a text file. Note that there are ways to parse XML files, but to see what we're working with a text file is a bit easier. 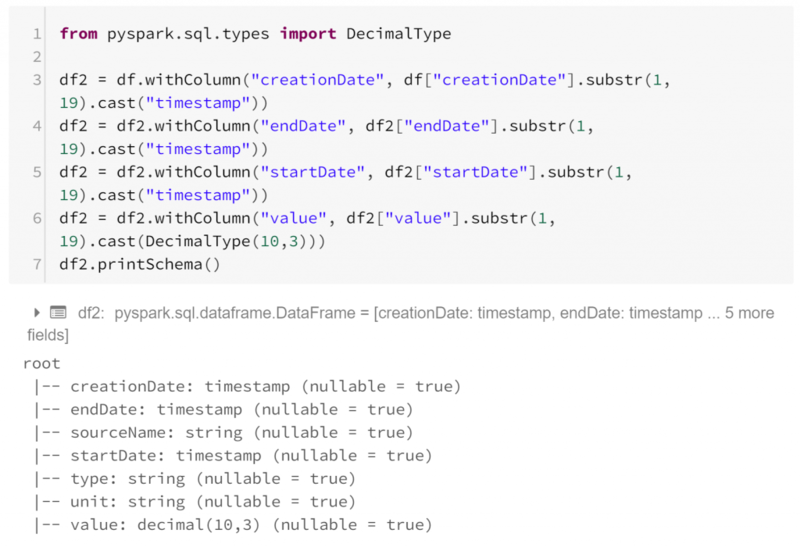 We've asked Spark (via sc, a representation of "Spark Context") to create a Resilient Distributed Dataset (RDD) out of our biometrics text file export.xml. Think of RDDs as Spark's standard data storage structure, allowing parallel operations across a cluster of machines. In our case our RDD contains 2.25 million lines from export.xml. But what do these lines look like? We've imported re, a Python module for regular expression matching. 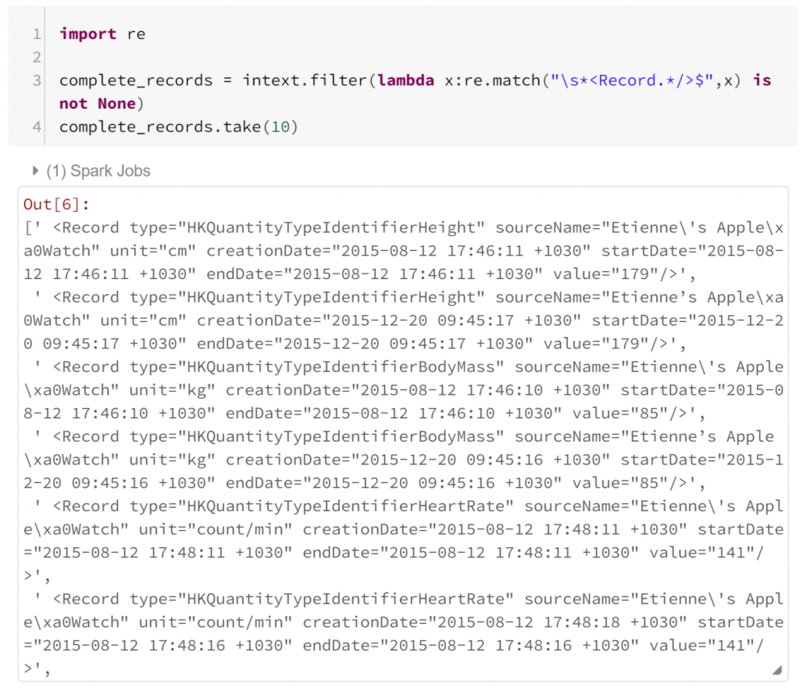 Using this we can filter our RDD to find records that begin with "<Record" but are not terminated with ">". Fortunately, it appears that this is not the case. We can also test for the case where there are multiple records in the same line, but we'll skip this here. Next we just need to filter our RDD to Record tags. In both of these regular expression checks, I haven't had to consider how Spark is parallelising these operations. I haven't had to think any differently from how I would solve this problem in standard Python. 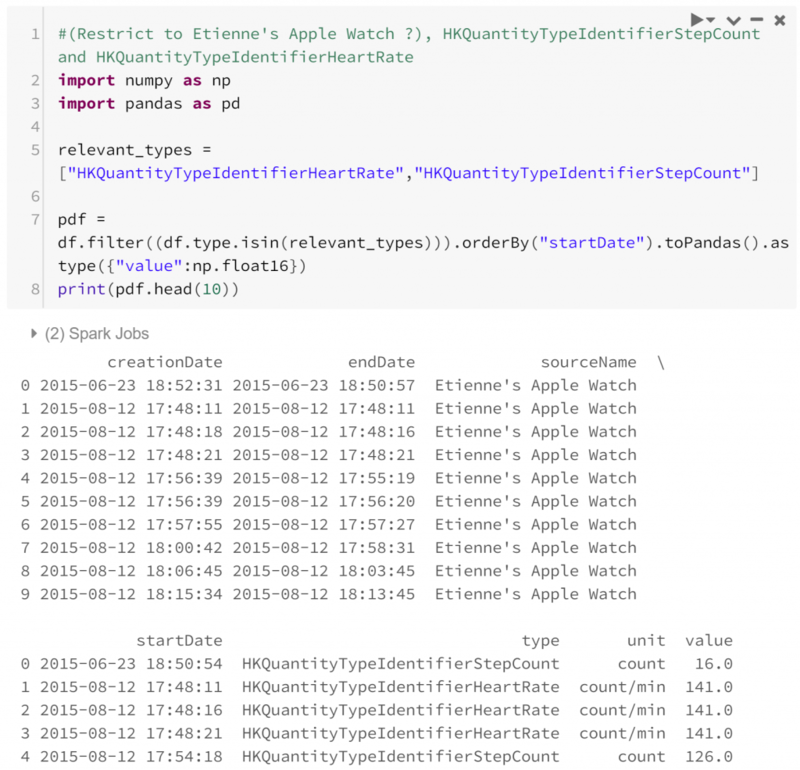 I want to check each record has a particular form - so I just import the module I would use normally, and apply it in the Pyspark filter method. 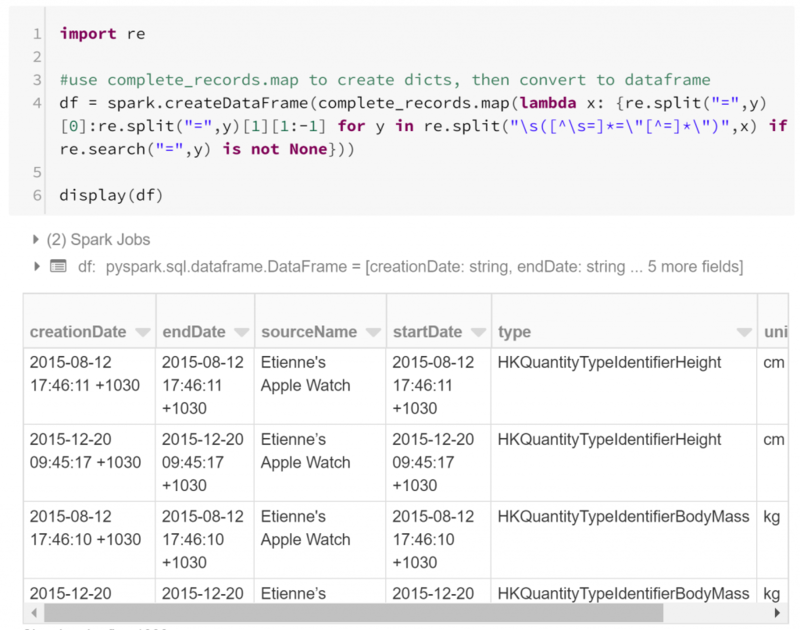 This has converted our RDD into a dataframe - a table-like data structure, composed of columns of fixed datatypes. By and large, the dataframe is the fundamental data structure for data science investigations, inherited from statistical programming. 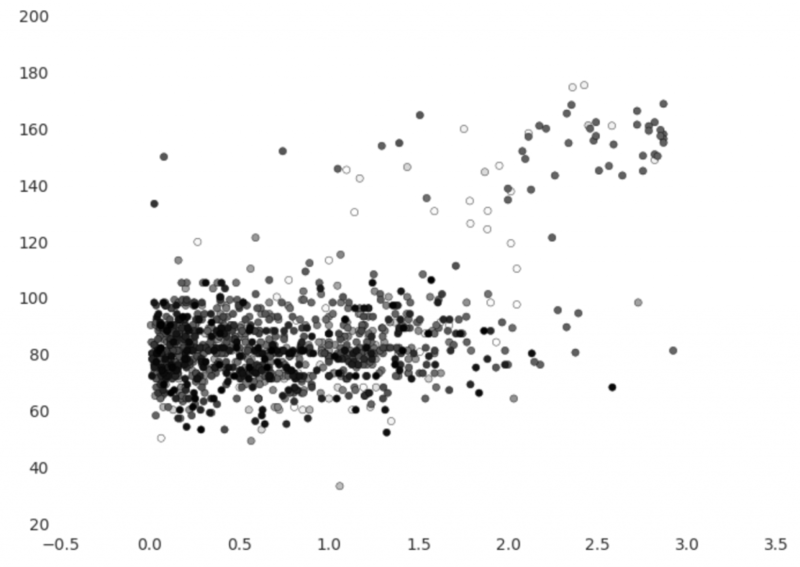 Much of data science is about quantifying associations between features or predictor variables and variables of interest. Modelling such a relationship is typically done by comparing many examples of these variables, and rows of a dataframe are convenient places to store these examples. The final call to the display function in the above code block is important. 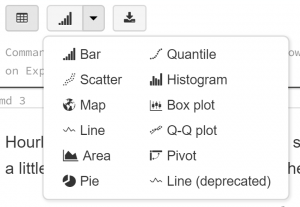 This is the default (and powerful) way to view and visualise your data in Databricks. We'll come back to this later on. So we have our raw data converted into a dataframe, but we still need to understand the data that actually comprises this table. Databricks is a great platform for this kind of work. It allows iterative, traceable investigations to be performed, shared and modified. This is perfect for understanding data - a process which must be done step-by-step and is often frustrating to document or interpret after the fact. Firstly in our step-by-step process, all of our data are currently strings. Clearly this is not suitable for some items, but it's easily fixed. So we have a structure for the data, but we haven't really looked into the substance of the data yet. Questions that we should probably first ask are "what are the kinds of biometric data observed? ", and "how many observations do we have to work with?". We can answer these with a quick summary. Below we find how many observations exist of each type, and between which dates they were recorded. Let's begin by looking into how step count might relate to heart rate. Presumably, higher step rates should cause higher heart rates, so let's see whether this is borne out in the data. 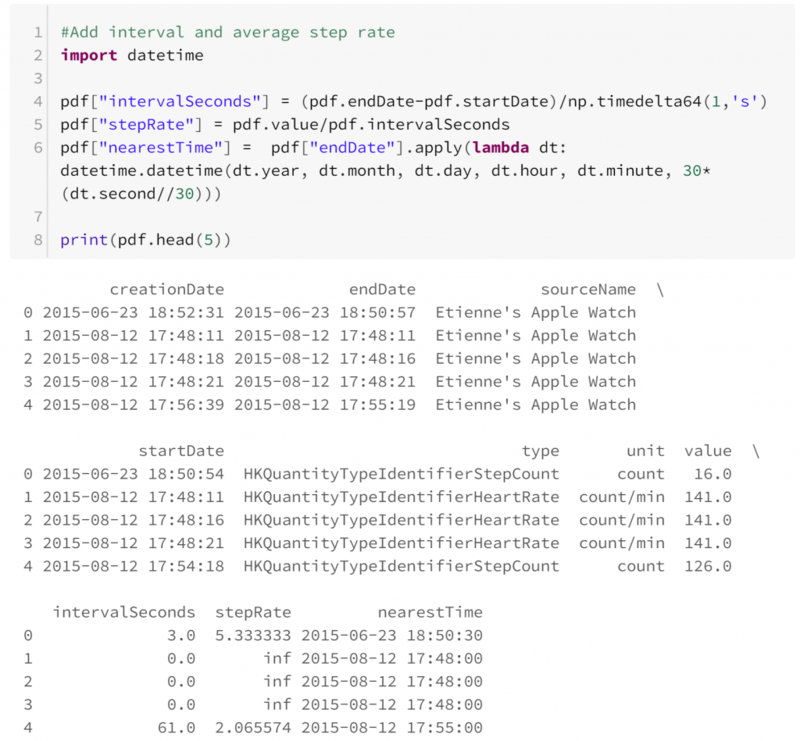 I've chosen to convert the data from a Spark dataframe to a Pandas dataframe to take advantage of some of the datetime manipulations available. This is an easy point of confusion for a starter in PySpark: Spark and Pandas dataframes are named the same, but operate differently. 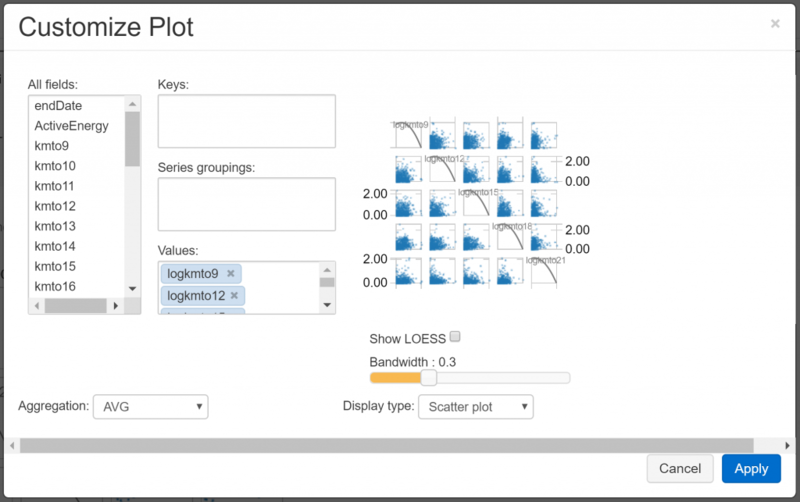 Primarily, Spark dataframes are distributed so operate faster with larger datasets. On the other hand, Pandas dataframes are generally more flexible. In this case since we've restricted our analysis to a subset of our original data that's small enough to be confident with a Pandas dataframe. On the vertical axis we have heart rate in beats per minute and on the horizontal axis we have pace in steps per second. Points are coloured so that older points are lighter, which allows us to see if there is an obvious change over time. The graph shows that Etienne's usual heart rate is about 80 bpm, but when running it increases to between 120 and 180. It's easy to notice an imbalance between usual heart rate observations and elevated heart rate observations - the former are much more prevalent. There appears to be at least one clear outlier - the point where heart rate is under 40 bpm. There are also a small amount of observations that have normal heart rate and elevated pace or vice versa - these may be artifacts of our imperfect reconciliation of step count and heart rate. We could feed this back to improve the reconciliation process or re-assess the assumptions we made, which would be particularly useful with subject matter expert input. The graph above shows the observations of step rate over time, with black indicating observations that have elevated heart rates. There are a few interesting characteristics - most obviously, observations are far more dense after July 2016. Also, rather alarmingly, there are only a small number of clusters of observations with elevated heart rates, which means that we cannot treat observations as independent. This is often the case for time series data, and it complicates analysis. We could instead compare the progression of heart rate changes with pace by looking at each cluster of elevated heart rate records as representative of a single exercise events. However, we would be left with very few events. Rather than attempt to clean up the data further, let's pivot. 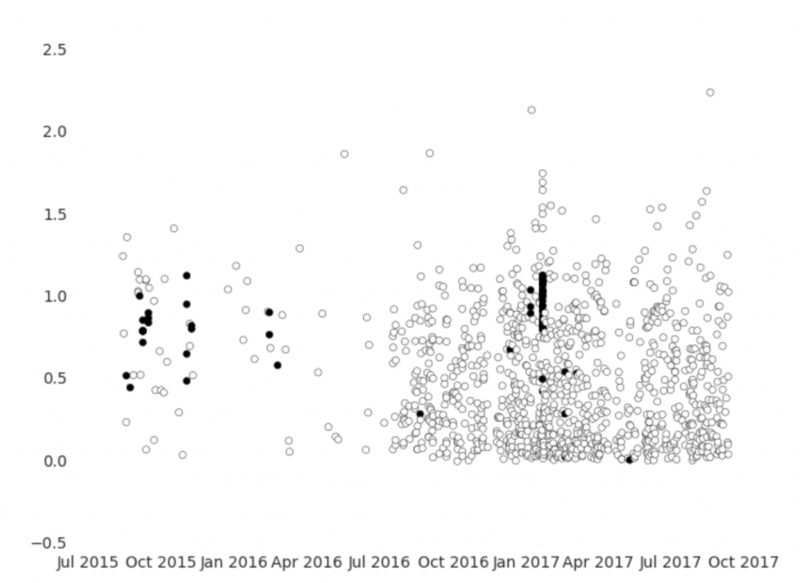 Instead of step count and heart rate, let's instead look at patterns in distance travelled by day since 2017. This pivot answers each of the above issues: it is limited to more recent data, it focuses on a single type of biometric data, and it allows us to compare on a daily basis. Mercifully, distance travelled is also one of the most prevalent observations in our dataset. You'd be right to say that this is a 180 degree pivot. We're now looking at an entirely different direction. This is an artifact of our lack of a driving business problem, and it's something you should prepare yourself for too if you commission the analysis of data for the sake of exploration. You may find interesting insights, or you may find problems. But without a guiding issue to address there's a lot of uncertainty about where your analysis may go. Use our udf to iteratively prorate distance travelled biometrics into the whole hour between 8am and 10pm that they fell into, naming these columns "hourTo9", up to "hourTo22". The features we have are in 14 dimensions, so it's hard to visualise how they might all interact. 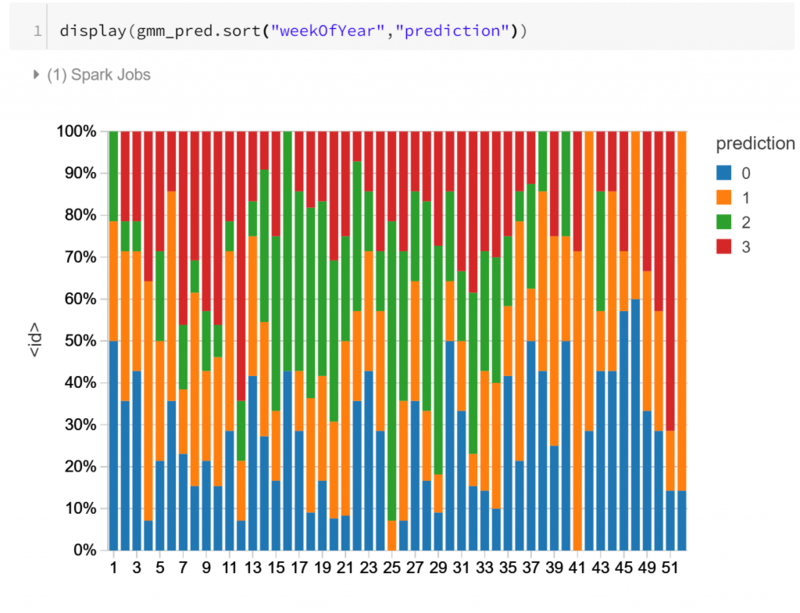 Instead, let's use a clustering algorithm to classify the kinds of days in our dataset. Maybe some days are very sedentary, maybe some days involve walking to work, maybe some days include a run - are we able to classify these days? I've arbitrarily chosen to cluster into 4 clusters, but we could choose this more rigorously. 4 is enough to show differences between different routines, but not too many for the purpose of demonstration. The graph above shows the 4 types of routine (labelled as "prediction" 0-3), and their relative frequency for each day of the week. Notably type 1 is much more prevalent on Saturday than other days - as is type 3 for Sunday. Type 2 is much more typical a routine for weekdays, appearing much less on weekends. This indicates that perhaps there is some detectable routine difference between different days of the week. Shocking? Not particularly. But it is affirming to see that the features we've derived from the data may capture some of these differences. Let's look closer. Type 0 has sustained activity throughout the day, with a peak around lunchtime (12pm - 2pm). Type 3 has a notable afternoon peak (3pm - 6pm) after a less active morning, with another smaller spike around lunchtime. Taken together, perhaps we can use the hourly distance features to predict whether a day is more likely a weekday or a weekend. This model might not seem that useful at first, but it could be interesting to see which weekdays are most like weekends - perhaps these correspond with public holidays or annual leave? Let's do a quick model to prove that weekends can be classified just with hourly movement data. There are a lot of possible ways to approach this, and a lot of decisions to make and justify. As a demonstrator here we'll create a single model, but won't refine it or delve too deeply into it. Based on the types of routines identified in our cluster analysis, it's fair to suspect that there may not be a monotonic relationship between the distance travelled in any particular hour and weekend/weekday membership. 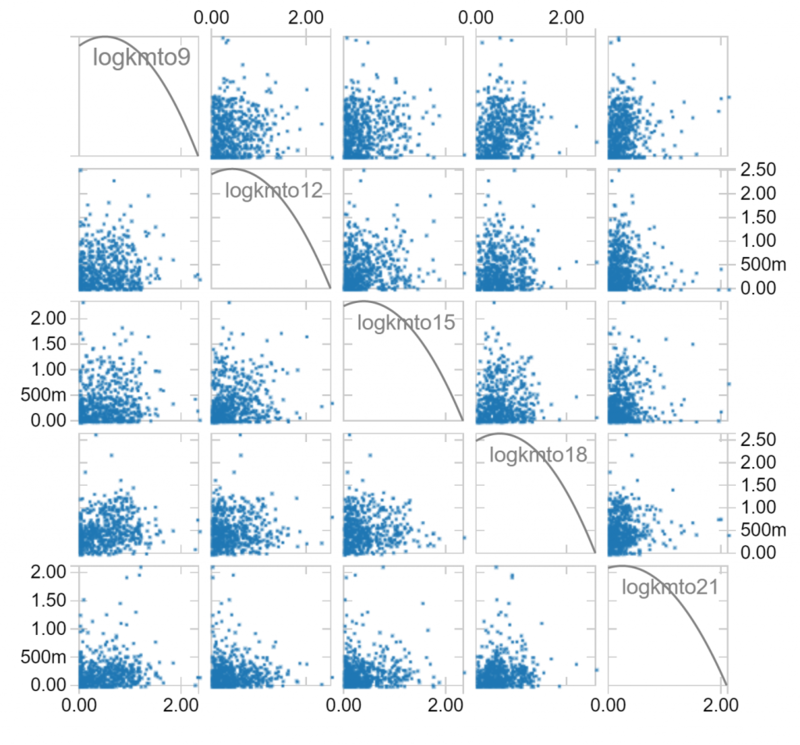 So rather than using the simplest classification model, logistic regression*, let's fit a random forest classifier. First, we need to include a label for weekends and weekdays. I choose to call this "label" because by default this is the column name that Pyspark's machine learning module will expect for classification. As usual to allow us to check for overfitting, let's separate the data into a training set and a test set. In this case we have unbalanced classes, so some might want to ensure we're training on equal numbers of both weekdays and weekends. However, if our training data has the same relative class sizes as the data our model will be generalised to and overall accuracy is important then there isn't necessarily a problem with unbalanced classes in our training data. Now let's prepare for model training. We'll try a range of different parametrisations of our model, with different numbers of trees, and different numbers of minimum instances per node. 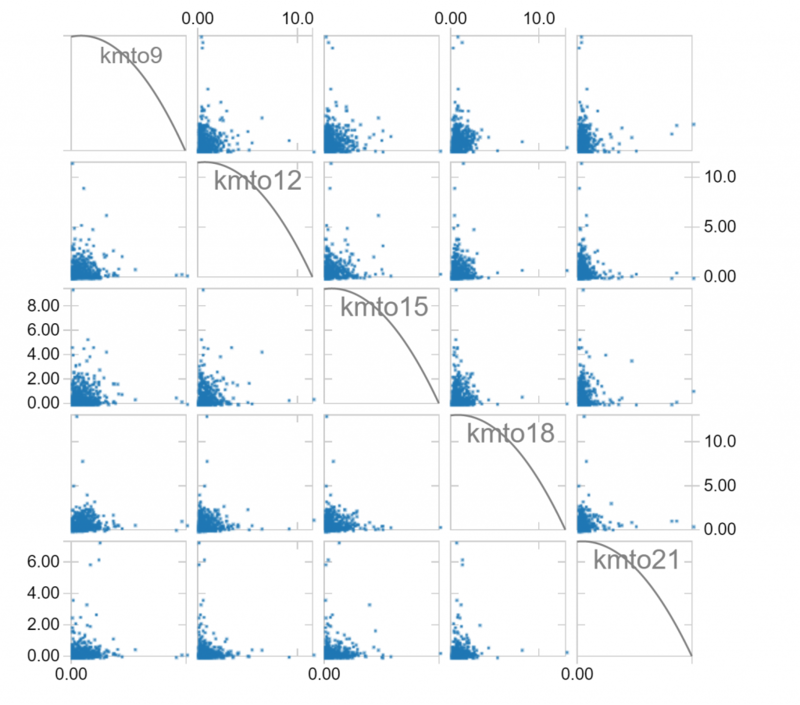 Cross-validation is used to identify the best model (where best is based on the BinaryClassificationEvaluator, which uses area under ROC curve by default). So our model is reasonable on our test data, with a test ROC curve covering 0.86 and an overall accuracy of 0.82, which compares favourably to the accuracy of our null model, which would classify all observations as a weekday and have an accuracy of 0.71. There are many more possible avenues to investigate, even within the narrow path we've taken here. This is a curse of exploratory analysis. Databricks gives us a flexible, collaborative and powerful platform for data science, both exploratory and directed. Here we've only managed to scratch the surface, but we have shown some of the features that it offers. We also hope we've shown some of the ways it addresses common problems businesses face bringing advanced analysis into their way-of-working. 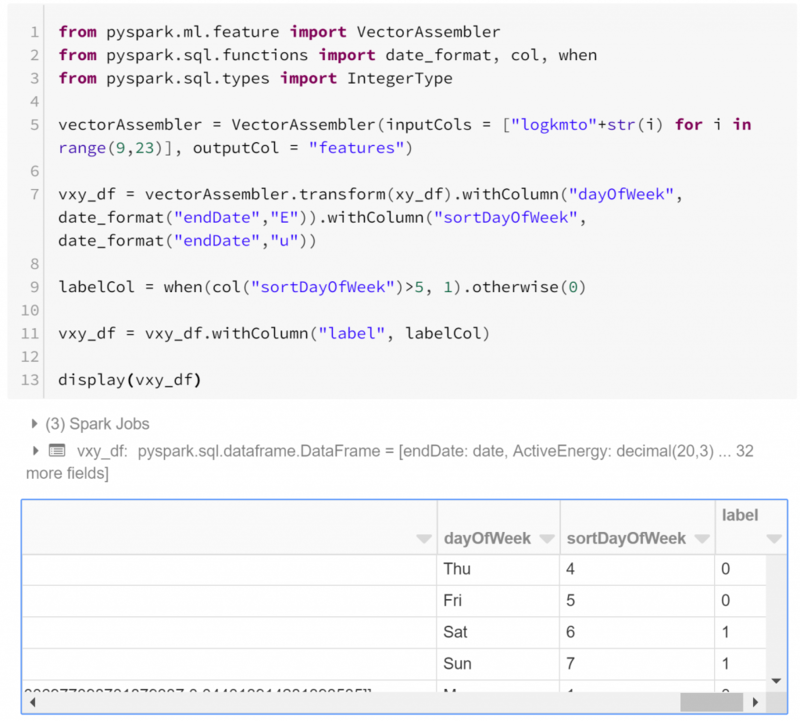 Databricks is proving to be an important tool for advanced data analysis.